OR's new drysack with and air permeable band for easy compression. I started backpacking and quickly became hooked on the outdoors, hiking various environments from the green mountains of the Appalachians to the barren desert of Arizona. I enjoy the solitude of deep backcountry, and prefer colder weather but global warming is making that tougher all the time. I’m usually a moderate weight hiker, but as an Emergency Medical Technician I’m trained to be prepared, so my pack usually weighs between 20 to 30 lbs (9 and 14 kg) while soloing, to 50 lbs (23 kg) when leading. Additional information about the author can be found at http://www.corridor9.net. 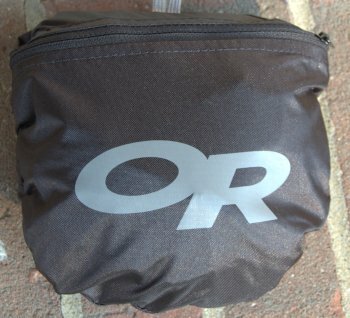 The Outdoor Research Hydroseal Drycomp AirX sack is one of OR's new dry sacks. 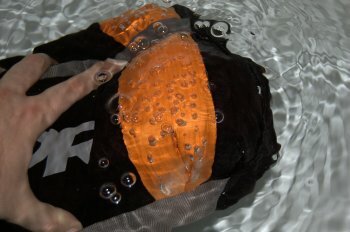 Unlike traditional dry sacks, or even previous Hydroseal Drycomp sacks made by OR, the new AirX designs have an orange band near the bottom of the bottom of the sack that is air permeable. This means that air will pass through the orange band while water will not. Most dry sacks out there function in much the same way as a Ziploc bag; in order to purge the air, there must be an opening near the top of the bag. However, this orange air permeable membrane allows the user to gain more compression without needing to purge the air from the top. The bag can be completely closed yet still not retain unwanted air. The problems of bloating due to trapped air and the inability to fully compress a stuffsack down to the smallest possible size are now a thing of the past. The Outdoor Research Hydroseal Drycomp AirX stuffsack arrived to my door inside a small brown box. Upon opening the box I found the stuffsack neatly packaged in its integrated stuffsack, wrapped in the retail packaging. I quickly removed the packaging and opened the integrated stuffsack to check out the new compression sack. My initial impressions are that this compression sack is going to be awesome if it does what it claims, however I am a bit skeptical due to the fact that I've owned some "dry fabrics" in the past that have let me down. After fully looking over the sack I weighed it and found that it actually weighed less than the manufacturer stated it would, which makes it all that much better in my mind; less weight is always a plus. Loosen Straps and Stuff Gear in Sack. Use Straps to compress load. Purge air by pressing down on top closure. 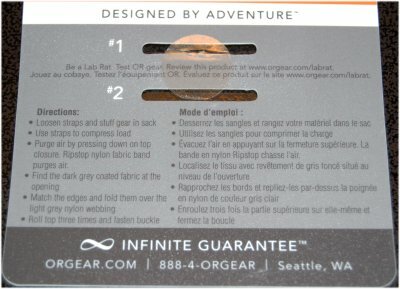 Ripstop nylon fabric band purges air. Find the Dark Grey coated fabric at the opening. Match the edges and hold them over the light grey nylon webbing. Roll top three times and fasten buckle. As with most Outdoor Research gear I've owned, their logo and name is prominently displayed in a few places. However, if I build the quality gear that they did, I'd want to make sure my name was prominently displayed too. After thoroughly looking over the bag I was unable to find any hanging threads, ripped or stretched seams, or damage to the sack in any way. All seams were sealed tightly, some with double tape, and there were no areas where the seam tape was pulling away from the fabric. The materials used in making this compression sack appear to be top notch. From the heavy grade black fabric, to the ripstop orange band, the heavy duty webbing and even the thick plastic clip; everything appears to be quality stuff. As you can see in the picture above, the orange band is some sort of ripstop fabric that is air permeable, but supposedly doesn't allow for water to pass through. The entire inside of the sack is coated except for the orange band. 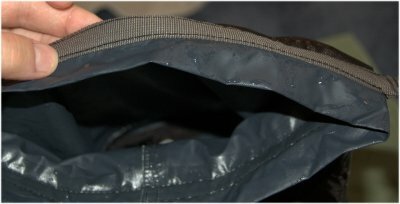 Even the integrated storage sack is coated in a waterproof material. While the inside of the orange band isn't coated, the seams are coated to prevent water from entering the sack through needle holes. Even the ladder area with multiple stitch holes has been well protected from the possibility of leaking water. While I haven't had the opportunity to test this bag for water resistance yet, I was able to pull one of my sleeping bags out of the closet to see how well it stuffed inside the sack. The picture on shows the relative size of the compression sack with my 35 F (2 C) Montbell Super Stretch Down Hugger #3 inside in comparison to the standard sized Nalgene on the right. 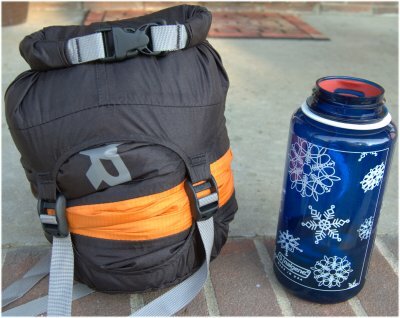 You can see that the sack compresses the sleeping bag down to roughly twice the size of the Nalgene bottle. You can also see that the compression straps are drawn fully, yet there is still some bulk to the sack. I was also able to compress the sleeping bag even more though I wasn't able to hold it compressed due to the fact that the compression straps are at the end of their pull. After shooting this picture and seeing how big the stuffsack actually is with the compression straps drawn fully, I had to try this again. I wanted to see if rolling the bags top closure down any more allowed me to compress the stuffsack even more. I was eventually able to compress the bag to a height less than that of the pictured Nalgene, and a diameter approximately the size of a standard volleyball. The ability to compress my down sleeping bags to such a small size while still protecting it from water is definitely a worthy quality from a stuffsack. One of the things that I did notice though when rolling the top closure down was the fact that the ring with the compression strap tensioners became more and more narrow. This caused a bit of a problem when I rolled the strap down too much. Because the ring was smaller in diameter, the sleeping bag puffed out from underneath the compression straps. One of the things that I definitely want to try before taking this bag on the trail is to test the water resistance in the shower. Being as how the primary reason I use a waterproof stuffsack with my sleeping bag is to protect it in the unlikely event of moisture inside my pack, knowing that this stuffsack will live up to its job is priority number one for me. This next week I'll be testing this out with some paper inside to see if any water leaks through the stuffsack while it's exposed to a bit of water from the shower. During this testing period I was able to use the Outdoor Research Hydroseal Drycomp AirX a total of three nights in the field. This occurred in the Great Smoky Mountain National park at an elevation ranging from 2420 ft (738 m) to 6475 ft (1874 m). The temperature for the area during this trip was between 41 F (5 C) and 80 F (26 C). There was no rain during this trip, though there was heavy frost one morning. 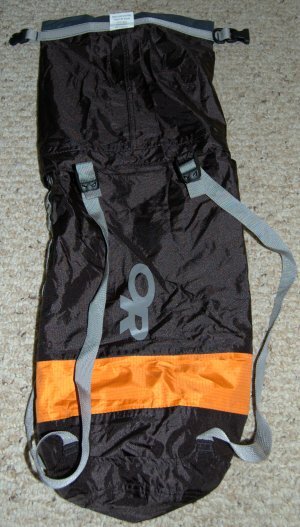 I also used this as a dry bag when carrying my Digital SLR around town during rainy weather. The sack didn't get exposed to any water during these trips. I am a bit of a skeptic when it comes to testing; if I don't see it work, then I doubt that it's going to. I know this, and occasionally approach items of gear I test with the notion that it's simply not going to work the way it's designed. It's my belief that something will break, fail, tear, leak, or simply not perform up to the manufacturer's specifications. I've had to eat my words a number of times in the past, and I'm likely to eat them again in the future. Naturally when this test came out I was in complete doubt that it would function the way Outdoor Research stated it should. I mean come on, an air permeable membrane that’s not going to allow water to seep back into the stuffsack over time... impossible. There is no way that this thing can be that water tight, it simply has to leak over time, right? Well once again I was wrong and I'm now eating my words. This stuffsack is amazing! I never in my wildest dreams thought it could prevent water seepage under normal circumstances, much less prevent any water from entering the sack under the rigorous testing I put it through. What I saw today would be considered a miracle in medieval times. I'd been putting off testing the Hydroseal Drycomp AirX in water for a while now simply because I was afraid I would be disappointed. I really liked the construction of the stuffsack and the way it was designed. It served its purpose as a stuffsack well enough, but I figured it would fail when it came to waterproofing. I decided the best way to adequately test this would be to get a bunch of newspapers, ball them up inside the sack, place a towel on top for filler, and compress the sack. I then dropped the whole thing in water, rolled it around a bit, and let it sit for 5 minutes. You can see in the picture on the left and top how wet the stuffsack became. There wasn't a drop of water inside the stuffsack at all though; the towel was dry, the paper was dry, everything about the inside of the sack was dry. That’s ok, I though, any mediocre stuffsack with a bit of water resistant material can protect the contents when floating on top of the water. At this point, I wanted the stuffsack to fail. I was going to put it through the worst case scenario, watch the water seep in, and have a bunch of wet newspaper to prove that this product can't keep out water like it says. 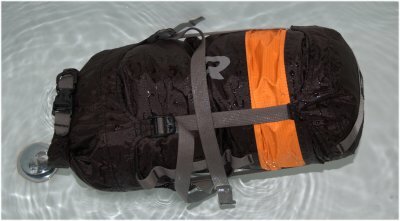 I wanted to see what would happen if I dropped my pack into a deep pool and couldn't retrieve it for a while. Once again, I placed some newspaper inside the stuffsack, but this time I left out the towel. I compressed a good deal of air out of the AirX and submerged it. I held it under the water and scrunched the sack with my fingers repeatedly for roughly three minutes before bringing it out. During that time I watched the air bubbles seep through the air permeable orange band. At one point they poured out so hard I couldn't get a clear picture due to all the ripples in the water. I even saw a few bubbles seeping up from the top opening. I removed the AirX from the water and let it drip a bit to remove some of the excess water. You can see by the picture below on the right how wet the sack was. I expected nothing less than a sticky soggy mess once I opened the stuffsack. My mouth dropped wide open and I was dumbfounded by what I saw when I opened the stuffsack. The entire contents of the AirX were COMPLETELY DRY! There wasn't a drop of water anywhere near the newspaper! The only water that I could find was around the top of the stuffsack near the opening, and this was little more than a few drops. Based upon the amount of water around the opening, I can't attribute this to water seepage. I think this was simply moisture from the fabric side of the stuffsack that was there after the first test. None of the seams leaked inside the sack, and while the entire outside of the sack was soaking wet the contents were dry as a bone. For me, this seals the deal on water resistance / waterproofing. I figure if my pack remains submerged for longer than 5 minutes, I've got bigger problems to tackle than a wet sleeping bag. In addition to the water test I can report that I have not found any tearing along the seams, hanging threads, rips, or damage of any kind. I have stressed the compression straps time and time again and have yet to pull them loose from the fabric. I did find out that while it is possible to open the AirX without releasing the compression straps, it is difficult to add or remove the contents. It is best to loosen the compression straps before rooting around inside the sack. The compression straps did not have a tendency to slip though, even when digging in the sack while it was compressed. So far, my only complaint is the length of the straps. When the stuffsack is compressed there is quite a bit of excess strap material hanging around. I have caught this material in the zippers on my pack as well as had it snag on other gear when removing the stuffsack from my pack. These straps could easily be shortened 2 - 3 in (5 - 7 cm) without losing functionality. It would also be nice to have some sort of elastic or hook and loop closure to secure the compression straps so they aren't flopping around when the stuffsack is compressed. I've had the opportunity to use the Outdoor Research Hydroseal Drycomp AirX stuffsack on a two day trip in addition to using it as a dry sack for my DSLR camera during inclement weather. The trip took place on the southern end of the North - South trail in the Land Between the Lakes Recreational Area. The land is fairly flat with an elevation range for this area around 400 ft (122 m) above sea level. While the temperature was not bitterly cold, it was a bit chilly during this trip. The afternoon temperature was roughly 50 F (10 C), but the early morning temperature dropped to roughly 31 F (-.5 C). There was no precipitation this trip though, so while it was cold, it wasn't dangerously cold. When I initially started testing this stuffsack, I had a few key questions in mind. First and foremost was the question about its ability to keep my gear dry. As I have stated before, I like to keep my down sleeping bag in the stuffsack so if a heavy rain does come, or something leaks in my pack, I won't be left out in the cold without proper insulation. 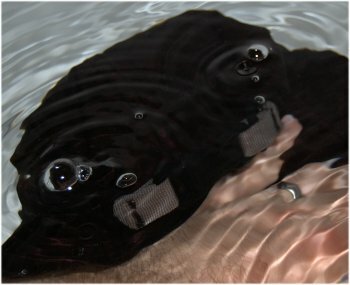 Up until this past trip, I thought that the only water this stuffsack would see would be the testing I did in the tub during the last report phase. While the amount of water the stuffsack saw during my trip was small, there was still some water contact. Our trip was cut short due to a problem with my wife during her pregnancy, and because I received a rather disturbing call early the second morning I didn't adequately pack my gear for the trip out. As it turns out, I had placed my water bladder right on top of my sleeping bag, and thus the Hydroseal Drycomp AirX. I had also placed the cooking gear right next to the bladder fill. As I was walking out, there must have been some rubbing between the cooking kit and the bladder fill hole as the fill cap loosened up a bit. I didn't see a lot of water leakage, but I would guess that approximately 1 cup of water leaked out right on top of my sleeping bag. As with the water test, the stuffsack proved its worth. Even thought I was headed home, the risk was still present. Had I been 2 nights into the woods without a way of quick egress, I would have had a very cold night. This bag protected my sleeping bag so well that there wasn't even a drop on the inside of the stuffsack. The rest of my gear didn't fare as well. In all, I was very pleased with the way this stuffsack performed throughout the entire testing period. The stuffsack held my sleeping bag and other equipment well. While using the Hydroseal Drycomp AirX as protection for my sleeping bag, I was able to compress all the air out of the stuffsack when it was fully closed rather than having to try and purge air before closing the sack like other water proof sacks. The straps didn't slip at all throughout the test. The straps don't show any wear, nor did they pull away from the compression ring. It also protected my expensive camera gear from the wet weather. Having a durable dry sack to carry around my camera in when the weather has turned bad was wonderful. I didn't have to worry about the material snagging on the camera, nor did I have to worry about any water getting inside the stuffsack and damaging my camera or lenses. The straps, which weren't tight due to the fact that I wasn't going to compress the camera, were used as handles. Not once did they slip or slide through the plastic clip. This stuffsack worked real well even when it wasn't used as a compression sack. 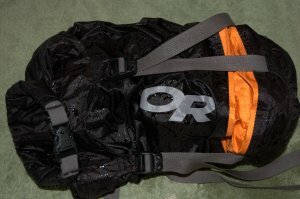 The Outdoor Research Hydroseal Drycomp AirX stuffsack may not have seen a lot of water in the field, but it did exactly the job I had in mind for it. 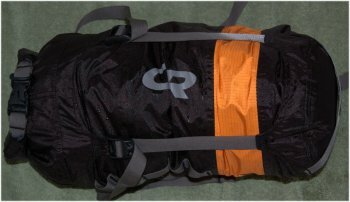 I'd like to thank Outdoor Research and BackpackGearTest.org for allowing me the opportunity to participate in testing the Hydroseal Drycomp AirX Sack.